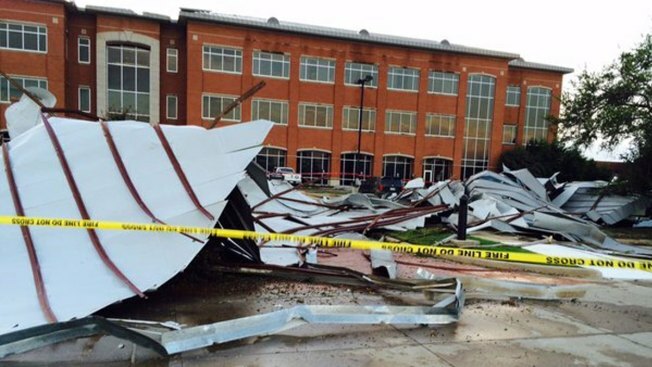 Roof damage from a storm that passed through Tarrant County, Nov. 5, 2015. Watch live video from the @TXThunderTruck in the player above. All active TORNADO WARNINGS and SEVERE THUNDERSTORM WARNINGS have either expired or have been canceled. A TORNADO WATCH that was in effect for most of North Texas, including the Metroplex, expired at 8 p.m. The counties that were included in the alert were: Bosque, Collin, Comanche, Cooke, Coryell, Dallas, Delta, Denton, Eastland, Ellis, Erath, Fannin, Grayson, Hamilton, Hill, Hood, Hunt, Jack, Johnson, Kaufman, Lamar, Lampasas, Mills, Montague, Palo Pinto, Parker, Rockwall, Somervell, Stephens, Tarrant, Wise and Young. A funnel cloud was spotted in Tarrant County as the storms grew in intensity Thursday afternoon. A short time later, NBC 5 learned the roof was blown off an office building near Sylvania Avenue and Meacham Boulevard in North Fort Worth. No injuries were reported. Primary threats included several tornadoes, scattered damaging wind guests up to 70 mph and isolated large hail up to 1.5 inches in diameter. Storms increased in the afternoon from Central Texas northeast into parts of Oklahoma. A Tornado Watch means conditions are favorable for tornadoes to develop. People in those areas should be on the lookout for threatening weather conditions and heed the latest statements and warnings.